Martha’s Vineyard and New Jersey artist and renowned pastor Bishop Donald Hilliard, Jr. 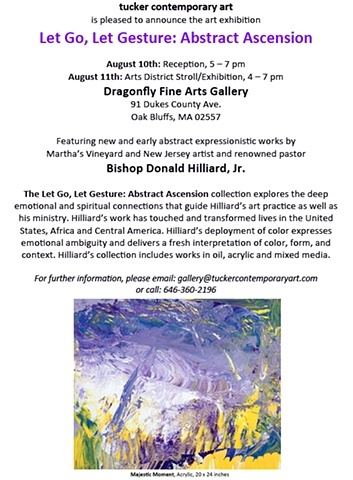 The Let Go, Let Gesture: Abstract Ascension collection explores the deep emotional and spiritual connections that guide Hilliard’s art practice as well as his ministry. Hilliard’s work has touched and transformed lives in the United States, Africa and Central America. Hilliard’s deployment of color expresses emotional ambiguity and delivers a fresh interpretation of color, form, and context. Hilliard’s collection includes works in oil, acrylic and mixed media.